“Mad Hungry Cravings” to be Published March 19, 2013! Yay! “Mad Hungry” from MSLO Executive Food Editor Lucinda Scala Quinn is one of my fave books–it’s gorgeous and the recipes are quite accessible. “Mad Hungry” was/is one of my favorite cooking shows as well. Lucinda oozes love for her family and her cooking is all about bringing family back to the table. Not a bad thing, right (depending on your family)? Now, LSQ has announced her follow-up book, “Mad Hungry Cravings”. FOMs: Knowing Lucinda Scala Quinn, we’ll all be craving these recipes in no time! Note: Remember, when possible, to buy books from your local independent book seller. If you love books, support those smaller businesses who struggle to compete in a competitive print media market. It may cost more, but it keeps their doors open for you! Preorder “Mad Hungry Cravings” online at Powell’s. It’s fun to get take-out, nobody’s saying you can never do it again. But we could all probably eat less of these more likely than not salt-and-fat-enriched dishes. Next time the craving for Pork Fried Rice or Sicilian-Style Deep-Dish Pizza hits, don’t reach for the phone, reach for Mad Hungry Cravings instead! Lucinda Scala Quinn makes it tastier, healthier and more affordable to enjoy restaurant-style fare with 173 recipes for the kinds of American, Asian, Latin and Mediterranean dishes typically found on a take-out menu. Love classic diner food? You’re covered with breakfast, blue plate specials (such as Chicken-Fried Steak with Sweet Potatoes and Collard Greens with Ham & Bacon on the side) and dessert. Color photos. Happy New Book! “Meatless” to be Published on January 8! Did your New Year’s resolutions involve a healthier diet? Well, here comes Martha to help with that! Over 200 easy meat-free recipes to get your new year started on the right foot. As a recent convert to the concept of “Meatless Mondays”, I can’t wait to check out the book’s sections that include: Stovetop Suppers; Soups, Stews, and Chili; and Substantial Salads. If you can, please consider purchasing the book from your local independent bookstore. (We must support them or they will disappear.) If you prefer to order online, consider ordering from Powell’s, an online independent book seller. FOMs: Let’s cook recipes from the book and share photos, shall we? No suprise here: USA Today named “Martha’s American Food” to its “10 of the summer’s most tantalizing cookbooks”. With recipes for summertime menu staples like Classic Potato Salad, Sour Cherry Lemonade, Hamburgers, and Barbecued Ribs, it is a must-have for anyone interested in establishing a basic repertoire of American classics. Now, excuse me, FOMs–I’m off to make some Malted Milk Ball Ice Cream for the weekend! FOMs: Please send me a note if you’ve included one or more of the recipes from “Martha’s American Food” in your cooking this summer! PLEASE NOTE: The website provides a recipe from “Martha’s American Food” for Classic Potato Salad (delicious!) but incorrectly calls for the celery, onion, and cornichons to be cut into 1-inch dice. According to the cookbook, these should be cut into 1/4-inch dice. Summer cookbooks; Will ‘Fifty Shades’ fade? – USATODAY.com. Today is the last day you can purchase your autographed copy of Martha’s American Food: A Celebration of Our Nation’s Most Treasured Dishes from Coast to Coast for only $30 (25% off cover price) on OpenSky! If you aren’t already a member of OpenSky, you will have to register–but it’s absolutely free to do so. Once you are a member, you can “follow” Martha’s recommendations (as well as recommendations from Martha Stewart’s Executive Food Director and host of TV’s “Mad Hungry”, Lucinda Scala Quinn) on products she really uses. To me, this is the closest thing we FOMs have to Martha By Mail now. You will have to move fast however, because this sale ends TODAY! Also, you can still purchase an autographed copy of Martha’s Entertaining: A Year of Celebrations on OpenSky too! Again, if you are not already a member of OpenSky, you will have to register–but it’s free to join! 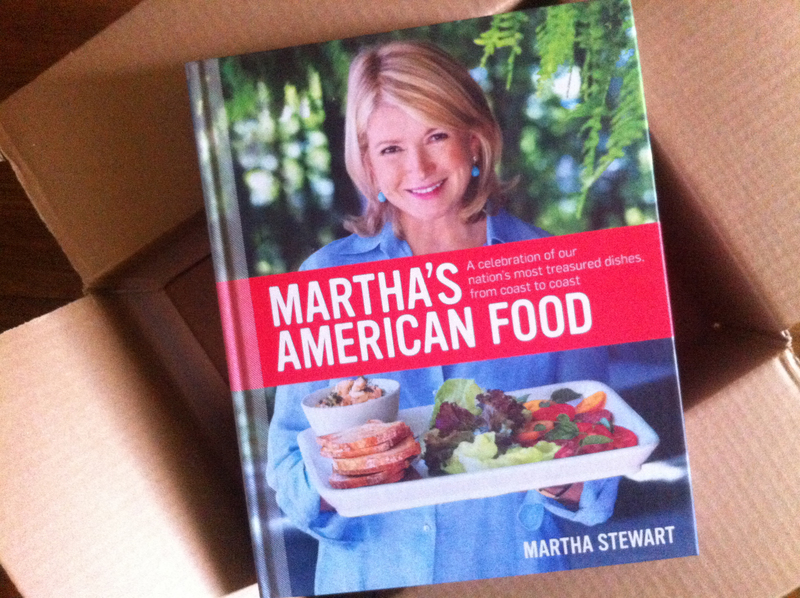 via Autographed copy of Martha’s American Food from Martha Stewart on OpenSky. Martha’s American Food is here! Martha’s new book, Martha’s American Food: A Celebration of Our Nation’s Most Treasured Dishes From Coast to Coast, arrived by mail this morning! It is an absolutely gorgeous cookbook–full of beautiful photography (every recipe has an accompanying photograph) and surprisingly simple recipes, many of which have been culled from Martha’s archives. What makes this new book special is the clustering of recipes into geographic regions: Northeast, South, Midwest, Southwest, and West. The book begins, however, with a collection of recipes labeled “All-American” featuring recipes that are part of every American-food lover’s list of favorites: Blueberry Pancakes, Meatloaf, Lasagna, Green Bean Casserole, Brownies–and so on. As a resident of California, I recognize many of the recipes from the West, but as a former resident of Texas, I look forward to revisiting the recipes of the Southwest. If you haven’t already, you can order the book from Amazon at a very reasonable price. What do you think FOMs? Share your thoughts about the new book here! Martha Stewart goes Prime Time on TV! Then, on May 7, she’ll turn up on an episode of CBS’ hit “2 Broke Girls” as herself. During the hour-long season-ending episode, Max and Caroline (Kat Dennings and Beth Behrs) try to get Stewart to taste their cupcakes. Martha, ever the diligent spokesperson for new products from MSLO, will also use this opportunity to promote her new book, Martha’s American Food: A Celebration of Our Nation’s Most Treasured Dishes, from Coast to Coast, which looks to be a massive collection of recipes, based on the above photo. Let’s hear from the FOMs: Are you planning to buy Martha’s new book? 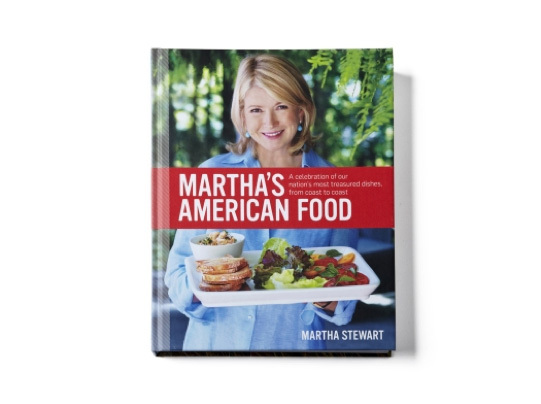 Martha’s latest book, Martha’s American Food will be released on April 24. If, like me, you just can’t wait until then to peer inside, you can view some pages now by using Amazon’s Look Inside feature. As expected, the photography is gorgeous, and the recipes look very approachable, covering comfort food basics such as Meatloaf and Chicken Potpie, along with regional favorites like Stuffed Quahogs and Biscochitos with Mexican Hot Chocolate. Flipping through the index, you can see clearly that this book is loaded with many, many tasty recipes, including cocktails! What about it, FOMs?–Are you planning to buy this book? I know I am!